This month Gala celebrates the Special Olympics, Intersport has an exciting announcement, there are places up for grabs in the Virgin Media Night Run, and Olympian Sonia O’Sullivan tells us what she loves about parkrun. When I was a kid, running was nothing more than a mode of transport. My mother didn’t drive, so once my father had gone to work I either had to walk or run to get anywhere – and I soon realised it was much faster to run! Much of my childhood was spent running and walking up and down the hills in Cobh, which kept me fit without me even realising it. Soccer was the most popular sport in the town and my father was the goalkeeper for the local team, which was doing really well at the time, so they were heroes to everyone and we followed the team every weekend. There wasn’t much sport for girls back then, so local community games and meeting with friends after school to do some athletics was what got me started in running. It wasn’t long before I was running with the Irish schools team, which led to a scholarship to Villanova University where I spent four years competing and ultimately qualified for the Barcelona Olympics where I finished fourth in the 3000 metres. This was when I realised that I could be really competitive at the top level and could already see lots of areas where I could improve. From there I went on to win the 5,000 metre world championship, the world cross country title and a silver medal at the Sydney Olympics, which I count as some of my proudest achievements. And then in 2005 I discovered parkrun. There was only one event back then, in Bushy Park in London, which I knew well because I practically trained there every day. parkrun added a whole new element to my training routine and it was great to be running in the company of others. There weren’t many participants back then – around 30 people took part – and I remember leaving my gear and a change of shoes in the back of Paul Sinton-Hewitt’s car. How times have changed! It took a while for parkrun to reach Ireland and I was so excited when it did. To see the growth and enthusiasm around the country is fantastic and a pleasure to be part of. parkrun is the best thing to get you out the door on a Saturday morning. I fell in love with parkrun from the start and through it I have met wonderful people from all corners of the world. I love finding new parkruns when I’m in a new place, and I can’t wait to earn my 100 milestone t-shirt soon. People are so friendly and I always find it interesting to chat with those who finish just ahead and just behind. It’s great to see so many different people getting so much from such a simple concept and enriching their lives through the parkrun community. My advice to people who are new to parkrun is to take it easy when you first start. Go along with a friend if you feel nervous, and remember that there is absolutely no pressure at parkrun. It doesn’t matter if you run or walk, you’ll see your improvements week to week and this will motivate you to keep coming back. Before you know it, parkrun will be a habit. These days I run to keep fit but I still set myself little targets to train for, and I also do some swimming and cycling to help avoid injuries. I feel so good after a run. I run because I can and I like that hungry feeling you get afterwards – food tastes so much better when you’ve earned it! March marked the first step in the Olympic journey for Special Olympics athletes in Louth and Meath as they compete in the Special Olympics Area Event for Bowling at the Drogheda Leisureplex. Taking place countrywide, thousands of athletes have been competing in 90 area events in multiple sports and the programme is the first step towards building the next team of Irish athletes to compete at World Games in 2019. 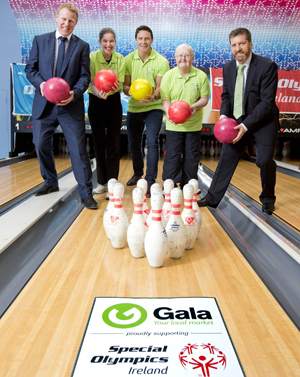 Special Olympics Ireland was joined by former Irish international rugby player and Special Olympics board member, David Wallace, and Gala Retail to announce Gala’s sponsorship of the all-island Area Events and a new four-year partnership. Gala’s journey with Special Olympics Ireland begins by supporting the all-island Area Events, and the relationship will reflect the four-year Olympic cycle, with Gala’s sponsorship continuing until the 2019 World Summer Games. Gala’s support also includes the Ireland Winter Games (2016), the World Winter Games (2017) and Special Olympics European Games (2018). Last year’s commitment to Team Ireland was a special partnership for Gala and from the outset, there were many special moments, right from the launch to the World Summer Games. As an Irish-owned convenience group, with almost 200 Gala stores across the country, all of our stores and their communities know either Special Olympics athletes, volunteers or someone within the Special Olympics family. Therefore, it’s a partnership that resonates with the Gala Group, and one that we’re extremely proud to be associated with. Kit is key to feeling good while you run and we are always ready with the latest and greatest from the brands. We are excited to announce that the new ASICS Gel-Luminus is now available exclusively at your local Intersport store. In great colours for men and women the shoes have the next generation DuoMax system which provides greater comfort and enhanced gait efficiency while the technical mesh upper stretches in multiple directions to create a glove-like fit. To complete the family of exclusive running shoes we also have the new men’s and women’s ASICS Gel-Glorify 2 and the Gel-Indicate 2. Whether you want unparalleled stability, unbeatable cushioning or a lightweight shoe to help you run longer and go the distance, we have the one for you so find your nearest store and try these little beauties on. We are always looking for feedback and have the shoes out with reviewers and bloggers (search for #RunLonger on Twitter). Remember to follow us on Twitter and like us on Facebook to keep up with what’s going on. Take your place on the start line at the Virgin Media Night Run in partnership with Athletics Ireland. Feel the heart-pumping excitement of night running. Take in some of Dublin City’s most iconic sites while you fill the streets, because they’ll be closed off and yours to conquer. 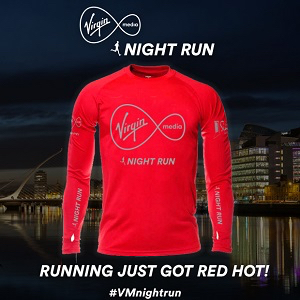 Virgin Media Night Run will take place on Sunday 22 May 2016 at 9:30pm. With a fast, flat course it’s the perfect opportunity for those seeking PBs! For parkrunnners looking to make the step up to a 10k, it gives the perfect opportunity to have fun while helping a great cause, as Dublin Simon Community is the official Charity Partner for the Virgin Media Night Run. This along with a high quality race top, chip timing, race number, finishers medal, goodie bag and an electric race atmosphere, this year’s run is not to be missed! Check out our Facebook page and click here to register. 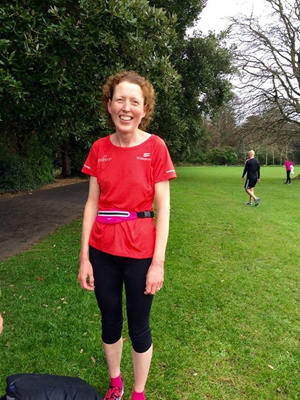 We were very saddened to hear of the recent death of Marlay parkrun regular and great friend, Karen Dexter. Karen and partner Chris travelled from Glendalough every Saturday morning to take part in parkrun and her love of the event and general joie de vivre became immediately evident to all who got to know Karen as both a runner and a volunteer. Over the past year Karen continued to participate in parkrun as a volunteer and many of you who did not have the pleasure of meeting her may well have been cheered on by Karen as a marshal or may have had a chat with her as a tail runner. 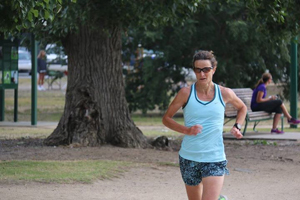 In November 2014 Karen wrote to us to tell her parkrun story which you can read here. On behalf of Marlay parkrun we would like to extend our condolences to Chris and family. Thanks to everyone at Castletown parkrun for making a few English tourists very welcome. The atmosphere was excellent and the course was beautiful. We will certainly recommend it to anyone we hear about who's visiting your neck of the woods. Andy, Amy, Jamie and Adam. I had a great time volunteering at parkrun as a first time marshal! For anyone who is thinking of volunteering but is nervous or unsure of what to expect, I was the same as you. But when you go there everyone is really friendly and you are well briefed on what needs to be done. It is great craic so c'mon guys volunteer – you won't regret it! parkrun has made a huge difference to my life. I was a marathon runner in my earlier years and a member of the Dublin City Marathon committee. Now in my sixties I noticed parkruns through Operation Transformation and was hooked. I took part in my first parkrun at Griffeen and have completed some in Sligo since then. To my great joy I discovered that the wonderful Patricia Kelly was in the process of setting up Lough Key parkrun and I joined the kickstart team. Our first run will be on 14 May. We are excited and nervous. Until then I will be taking part in Sligo parkruns in Cleveragh Demesne. parkrun is a wonderful concept. To be running again, however slowly, is a joy and thanks to the friendliness of the teams at Griffeen and Sligo I am encouraged every time I run. Here's to many more parkruns. Has parkrun made a difference to your running or your life in general? If so, we’d love to hear about it! Please get in touch. Occupation: Currently on parental leave from the Higher Education Authority and fully employed with my four children! Favourite volunteer role: Finish Tokens. I love being at the finish line to cheer the runners home and congratulate them. Everyone is always so delighted to cross the line and get their finish token. 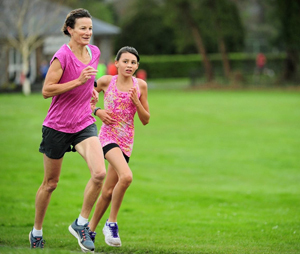 What do you do at parkruns: At home parkrun is known as "Mammy's parkrun" as it's my hour away every week and my husband, Fergal, takes the kids off to swimming lessons. I cycle to St. Anne's and usually get there around 9.10 so there's plenty of time for a few stretches and most importantly a catch-up with fellow runners. There are a few "die-hards" who like me rarely miss a run and I love the chat beforehand. After the run there's usually time for another quick chat and sometimes a coffee. Then it's back on the bike and off to see how the swimming lessons are going! 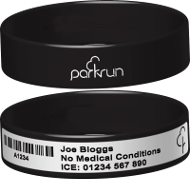 How has parkrun changed your running: Before parkrun I just dabbled in the odd bit of running by myself. Since my first parkrun I've become much more aware of running times and distances and I really enjoy setting personal goals for myself and getting new PBs. As a result I've become much better at exercising and going for runs during the week. So parkrun has been hugely instrumental in me becoming fitter and faster! What do you like about parkrun: The friendships. There is always a great buzz and atmosphere at parkruns and everybody talks to and encourages each other. I have made some wonderful and special friends at parkrun whose friendships I value hugely throughout my life. Most memorable or funniest parkrun moment: Last December after a week of particularly bad rain, a stretch of the route at St. Anne's was completely water-logged and there was no way to avoid it. At the pre-run briefing we were warned about it but I was just expecting the puddles to be worse than usual after rain. But instead I found myself wading through freezing cold water more than knee-high deep for what seemed to be at least 20 metres! Definitely felt like it was parkswim at that stage. I remember thinking that it was crazy trying to run through that water in the middle of winter and no-one thinking straight would opt to go through it again, but instead would call it a day after one lap of the two lap St. Anne's route – but of course I'm hooked on parkrun so I did the second lap and so did every other runner too. For the record, the shoes dried out fine and survived to do many more parkruns!